Like anything else in life, organization and attention to detail play a major role in the success of an event. A timeline is an integral tool in your planning process because it helps you to keep track of all details and assists you in organizing the schedule of task and events. Keep track of various tasks all in one place. Organize appointments and arrange schedule. 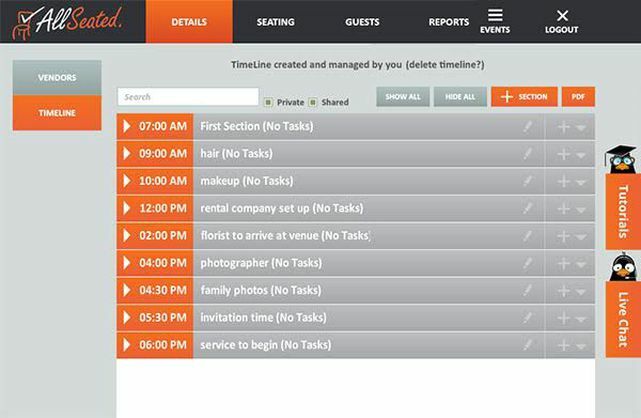 Ensure that vendors are in sync with the details and timing of your event. Sometimes people do not realize that event preparation and timing affects more than just the event host or bride and groom. All of your vendors and your bridal party need to be in sync as well! What time is the bridal party needed for photos? What time is hair and makeup? When can the florist get in to set up the centerpieces? What time can the band arrive to set up their instruments? When can the rental company arrive to set up their tables and chairs? When everyone is on the same page and working from one established timeline, there is less chance for details to fall through the cracks and a better chance for everything running according to your plan. AllSeated provides you with a timeline in your account! 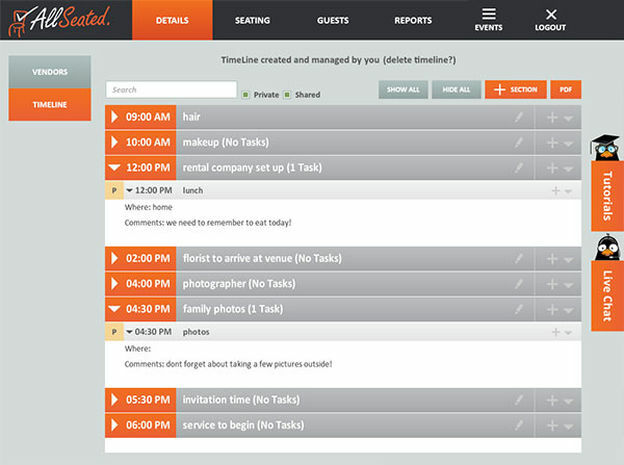 Along with managing your guest list and seating chart, you can also create your timeline. From the minute the bride wakes up in the morning to the minute she gets to the reception, all details and tasks are easily tracked and stored. You can invite your vendors (as well as anyone else you wish) into your timeline for collaboration so that you are all on same page. You can even add tasks to your timeline with comments so that you really won’t forget a thing! The use of a timeline in conjunction with organizing the rest of your planning details in your AllSeated account keeps the stress typically associated with planning an event at bay. With everything in one place and easy access to your account from anywhere at any time, it’s super easy (and even fun!) to make changes/additions with just a simple click of a button.